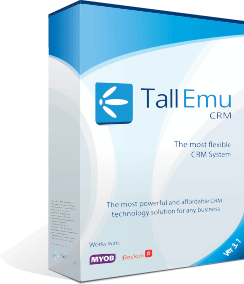 Tall Emu CRM makes managing the paperwork for selling your goods and services real easy. Regardless of your internal selling and billing procedures, Tall Emu CRM will support you in creating, modifying or sending that paperwork. We have online quotes and payment taking. If you use MYOB, Exo, Reckon Accounts, Xero or QuickBooks …we can have this data pushed into your accounting software (manually or automatically) without having to re-key it. So regardless of how you sell, be it offline (via phone or email) or purely online (through a shopping cart) we take away the double keying of data out and where we can, we can automate it. Every Sales Order, Quote or Invoice can be generated from within the CRM and then sent to a customer. If you need to send invoices or charge credit cards on regular basis you can set this up in Tall Emu CRM. This can include reminder emails for payment. The advantage of using CRM to manage this activity is because it’s held centrally, meaning it can be shared and is visible against a company record. This data can also be analyses or be reported on, as part of the sales funnel analysis (IE. how long it takes for an opportunity to turn into a sale) or as a way of managing outstanding invoices. Using our templates to customise the Invoices and Quotes to suite your business using your Logo and Company details. Create in an easy to follow and comprehensive data capture screens using the data fields that are suitable for your business. Publish and send in various formats, PDF, MSWord etc. Automatically recorded against billing entity. Sales Orders and Quotes can be quickly converted to an invoicing without having to recreate them. Easy payment allocations to outstanding invoices. Setup of automatic email reminders for overdue payments. We support all major Australian accounting systems (that link with Tall Emu CRM). If you’re interested in finding out more please call us or request a demo.